These industrial air bag inflatable are suitable for all packing, bracing, and void fill applications. Durable enough to stand on without breaking, they have a clean attractive appearance and are eco-friendly. They are professionally sealed and have the unique ability to withstand unexpected conditions and stretch instead of popping at the seal like most air pillows making them very reliable. They are also the lightest void fill available at only 1 gram per pillow weighing in at only about 3 ounces per 100. Air pack pillow inflates easily with a manual air pump given with this product only. Weighs merely 5 to 7 grams. Don't pay extra to ship heavy and inefficient paper fill. 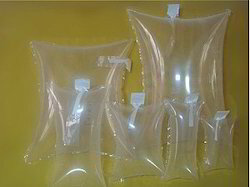 Completely reusable void filling, gap filling air bags. Can be inflated and deflated using a common drinking straw. Can be used N number of times. Gap filling airbags stores compactly. Completely reusable. Can be inflated and deflated using a common drinking straw. Can be used N number of times. Stores compactly. Don't consume precious space with big bags of packing peanuts. These industrial air pillows are suitable for all packing, bracing, and void fill applications. Durable enough to stand on without breaking (150 pound static load), they have a clean attractive appearance and are eco-friendly. They are professionally sealed and have the unique ability to withstand unexpected conditions and stretch instead of popping at the seal like most air pillows making them very reliable (see images). They are also the lightest void fill available at only 1 gram per pillow weighing in at only about 3 ounces per 100. Looking for Air Bag Inflatable ?